For a long time I said that “Money Flow” determines a currency pair’s direction. But I’ve never been able to quantify that concept using an indicator. I’ve tried various things over the years: inflation differentials, interest rate differentials, etc. All of these were commonly accepted theories but were disproven in the light of historical data. On a 12 month basis, the United States has been running widening trade deficits for decades. The trade deficit of the U.S. must equal the trade surplus of the rest of the world. So the 12 month change of non-gold international reserves held by all central banks (excluding the Federal Reserve) minus the trade surplus of the rest of the world should be a proxy for capital inflows (and outflows) to the rest of the world from the U.S.
*FYI, I highly recommend Yardeni’s book. It’s definitely the best book out there for macro traders and investors. 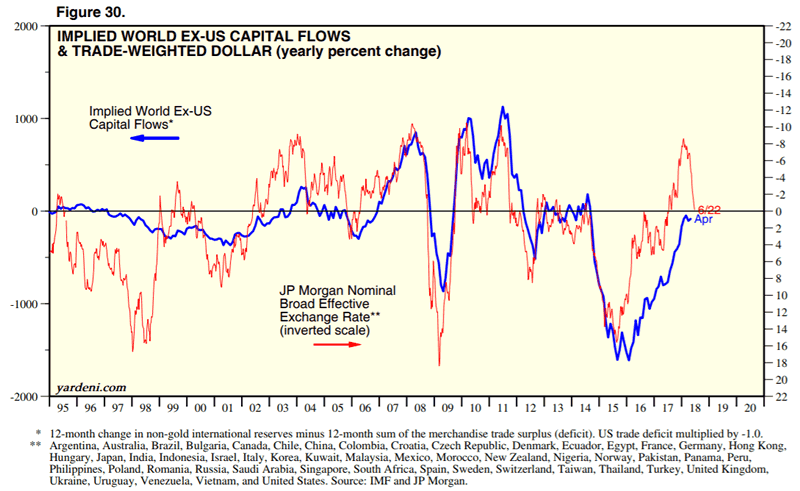 This is Ed Yardeni’s way of calculating international capital flows. And it works. It has a very strong correlation with the 12 month percent change in the U.S. Dollar. This suggests that the U.S. Dollar is more sensitive to capital flows than trade flows (capital flows tend to be more volatile, trade flows tend to be more persistent and slow moving). Ed uses a trade-weighted U.S. Dollar Index, which is better than the USD Index. An even better measure is overlapping the 12 month PERCENTAGE of non-gold international reserves vs. the 12 month change in the U.S. Dollar (inverted). As you can see, the 12 month PERCENTAGE of non-gold international reserves and the 12 month change in the U.S. Dollar (inverted) tend to move in the same direction. This means that money flowing to the rest of the world is bearish for the U.S. Dollar, and money flowing to the U.S. is bullish for the U.S. Dollar. 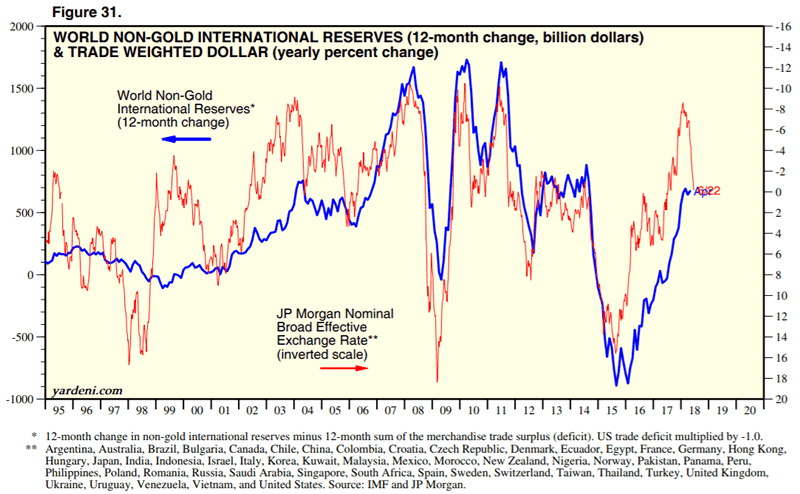 You can see that the data on non-gold international reserves lags by 2 months. Hence, the 12 month percentage change in non-gold international reserves is not always a leading indicator for the 12 month change in the U.S. Dollar. Non-gold international reserves can be used to confirm the U.S. Dollar’s current trend (i.e. a trend following indicator). Non-gold international reserves are starting to flatten. This suggests that the U.S. Dollar will start to flatten and will most likely swing sideways in a wide range. 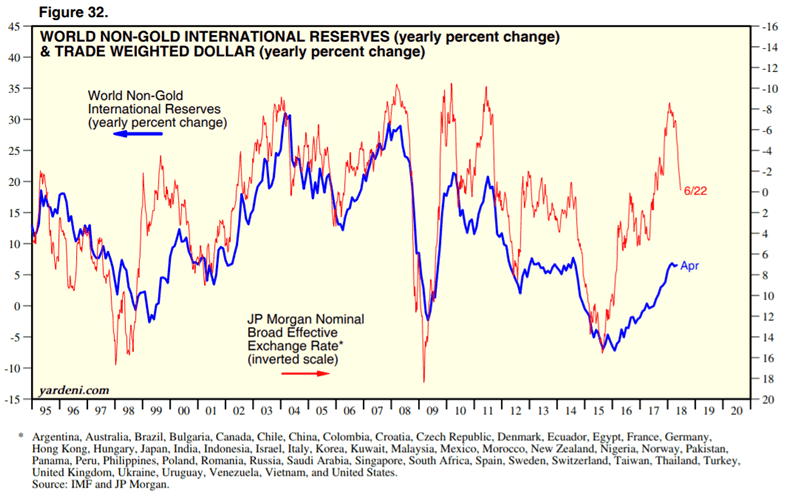 A big USD bull market or bear market is unlikely right now because the 12 month percentage change in non-gold international reserves is flattening. With that being said, the elephant in the room are Trump’s tariffs. If Trump’s tariffs cause world trade to decline significantly, then that is a medium-long term bullish factor for the U.S. Dollar because it’ll cause non-gold international reserves to decline. At the moment, Trump’s tariffs have not had a significant impact on world trade. Click here to see other trading models.